This recipe is completely improvised. I had some boneless chicken breasts sitting out, defrosting and I had no recipe. 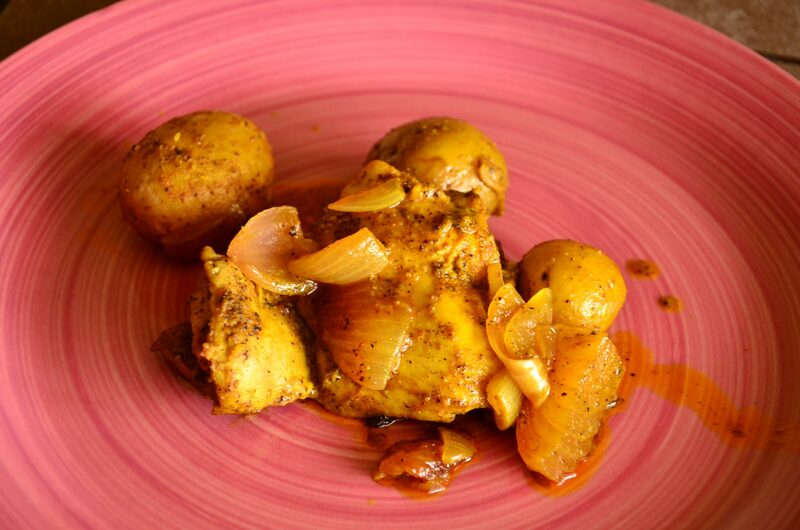 Bored of cooking it in a curry or making it in a dry Indian style I decided to tweak my marinade and put the chicken with some small potatoes in the oven. What turned out was yummy! Black Pepper, according to taste. Red chili powder, according to taste but about 1 tsp. Green cardamom powder also 1 tsp. 6-7 baby potatoes, unpeeled, halved. 1 large red onion, diced. Mix all the ingredients in a cup and pour over the chicken breasts. If you are comfortable using your hands then rub the marinade gently into the chicken. With a knife make a few small cuts on each piece. This helps in the absorption of spices from the marinade. Cover the container and leave it sitting at room temperature for about an hour. While the oven is heating up pick out a handful of baby potatoes, 6-7, and wash them thoroughly. Baby potatoes usually have a very thin skin so you needn’t peel them. 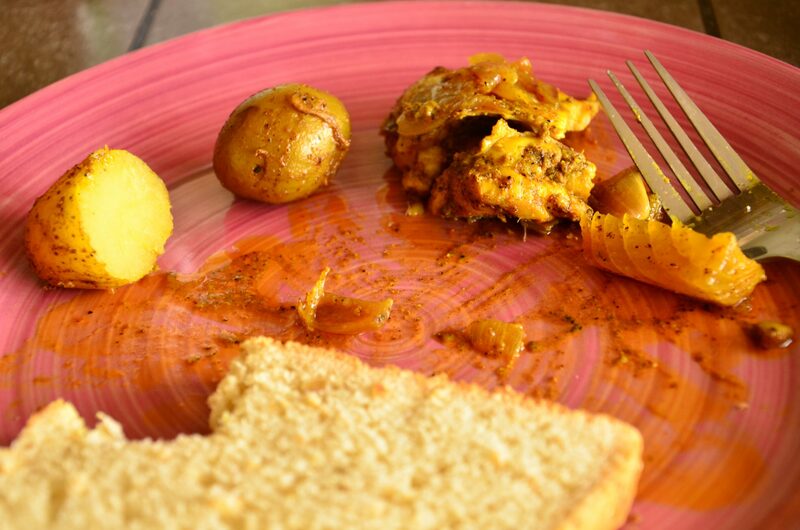 Cut the potatoes in half and dry them with a paper towel. Sprinkle some oil on the base of a baking tray, just enough to lightly coat it. When the oven is ready pick out the marinated chicken and place the pieces in the tray along with the potatoes and onions. Cook at 400F for about ten minutes then turn the pieces and cook for another ten minutes. Reduce the temperature to 350F and turnover the pieces once more. By this time the juices from the chicken and the onions would’ve started flowing, make sure to baste the potatoes with it. Finally, turn over the chicken once more and cover the tray with a piece of foil, cook covered for 10 minutes and midway turn off the oven. The chicken will continue to cook because of the trapped heat. This is best eaten with a green salad and some warm bread. Whenever you are ready, serve and enjoy! Gingered Chicken- A+ for Easy! Follow us on Instagram, Facebook and Twitter; and you’ll never have a bland day! will surely ..seems easy and good..